The Aussie summer may be sizzling, but Norwegian Cruise Line is keeping its passengers cool as can be with a brand new Snow Room on-board its newest fleet member. Scheduled to hit Caribbean seas this November, Norwegian Escape is brimming state-of-the-art features. The Snow Room is part of the ship’s exclusive Thermal Suite, a facility that makes up part of the ultra-luxurious Mandara Spa. Spanning across two decks, the spa boasts stunning ocean views and is open to all passengers over 18. For an extra surcharge passengers will be able to by themselves into the pampering palace which features a hydro-therapy pool, steam room, dry sauna, 17 heated loungers, salt room and samarium. 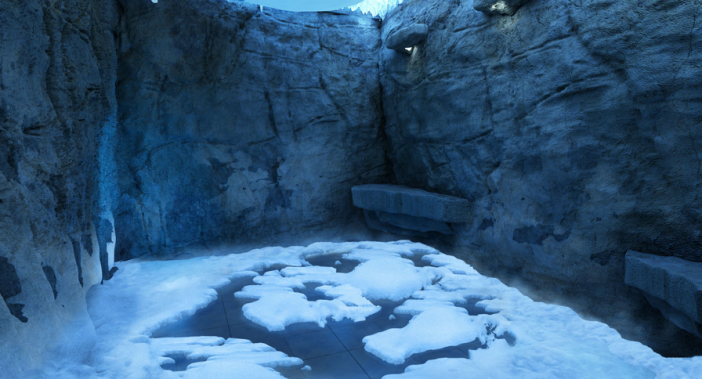 After working up a sweat guests can cool off in the Snow Room which sits at a chilly -6 to 1 degree Celsius. Throughout the day the room will whip up a series of snow flurries designed to foster an array of health benefits including stimulating blood circulation and strengthening the immune system. The Snow Room will also be the perfect retreat for passengers wanting to escape the blazing Caribbean sun. From loved up couples to parents on the search for some peace and quiet, Norwegian Escape offers a range of adults only extras throughout the vessel. As well as indulging in a session at the Thermal Suite and Snow Room passengers can hit up Spice H20, a child-free serenity lounging area which transforms into a lively nightclub when the sun goes down. Those prepared to fork out for an utterly private experience can purchase passes to the Vibe Beach Club, an elite decked out with sun loungers, water features, chilled towels, an oversized hot tub and complimentary fruit skewers. Currently under construction at Germany’s Meyer Werft, 4248 capacity Norwegian Escape will be one of the line’s all new Breakaway Plus class. Guy Harvey’s eye-catching artwork will grace the hull while the ship’s interior will feature the line’s trademark elegance. Based in sunny Miami, the 164,600 tonne liner will cruise the Eastern Caribbean and call at ports located in the U.S. Virgin Islands, the British Virgin Islands and the Bahamas. Want to be one of the first to snap up a spot on-board Norwegian Escapes inaugural voyage? Head over to Cruise 1st for all the latest news and offers on Norwegian Cruise Line itineraries! Images sourced via NCL Media center. Credit: NCL.